Just another beautiful day in Paris. 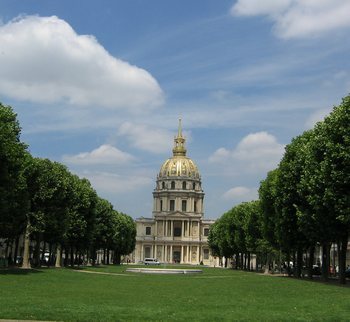 This is Invalides, where Napoleon’s tomb is located. 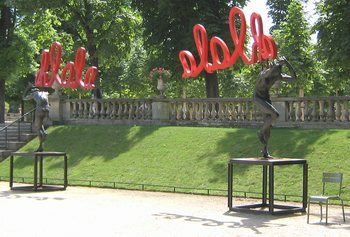 Public art in the Luxembourg Gardens. Art nouveau doorway in the 7th, near the Champ de Mars. 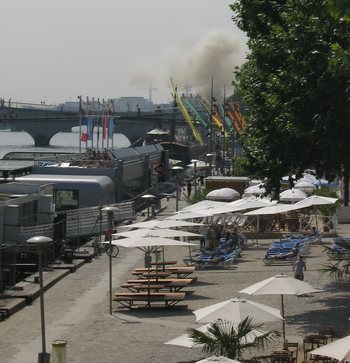 Another view of the Paris Beach, left bank, with the trash burning plant in the background. Some of my favorite French doors near the Champ de Mars. At last July is about to be over. The Parisians are leaving in droves. If only the work being done on our street would be finished, it would be nice and quiet around here. A few days ago, all four of us set out for a long walk up to the Parc Monceau, to see the park, and to go to one of the two museums there. We decided on the Musée Nissim de Camondo. Years ago, Tom and I went there and I wrote about the place and the Camondo family’s tragic story (see Friday, August 25, in the Paris Journal for 2000). I am happy to report that this museum with its fine, intact collection of 18th Century furniture and art has been renovated by France. It is much more appropriately cared-for now, and each visitor is given an audioguide (in English, if you’d like) that is excellent – probably the best museum audioguide I’ve ever experienced. When we visited the museum in 2000, the home was dingy, and there was not much info about the Camondo family. I remember one xeroxed French article about the family’s fate in a plastic sleeve tacked up on a wall that was near the exit. It could easily have been missed. I didn’t miss it, and I was shocked when I read about the family being deported to Auschwitz. What I wrote about the family in 2000 was mostly from information I gathered on my own. 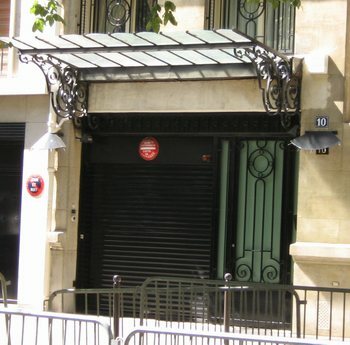 Now, however, the museum provides much more information about the family and what happened to them. It makes the collection all the more interesting, I think. My information from 2000 has one error – the family was deported in 1943, not 1945. Beatrice’s two children died in 1943 in Auschwitz. She did not die until 1945. It must have been horrible for her. Wikipedia, by the way, says Beatrice, her husband, and her two children all died in 1944. That is incorrect, if one believes the information in the museum. I thought we’d walk back home after seeing the museum. First we stopped in a wonderful little café at the corner of rue de Lisbonne and rue de Courcelles. I forgot to pick up a card for the place, I don’t remember the name of it, and I cannot find the receipt. So I went onto the city photos part of the orange.fr web site, and all I got was this picture of the building in a state of reconstruction, so I still cannot tell you the name of the café. Hopefully, we will get back there this summer. Madame at the café greeted us very cheerfully even though it was almost 3PM, normally too late for lunch. But she welcomed us, explaining that we’d be more comfortable inside (rather than on the terrace on the sidewalk) because it was air conditioned. The place was still almost full of well-dressed business people finishing long business lunches. But the atmosphere was casual and the prices were right. There was a 15 euro menu that included three courses, so that’s what we all had. 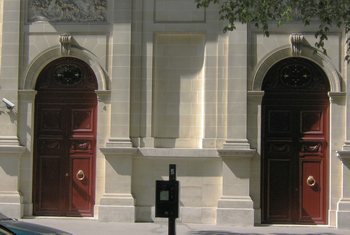 After that late lunch, Tom said that Dan and Mary wanted to go to the Saint Sulpice area. He doesn’t really have a sense of distance and geography here, so he didn’t realize how far that was. But I studied the métro map and decided that it was no good taking the métro . It was too far, too much time spent underground on a nice day, and there was no way to avoid that dreadful number 4 line with all its pickpockets and crowds. So, believe it or not, we walked all the way from the Parc Monceau area to Saint Sulpice. Everyone was darned tired when we finally took the number 10 métro home to the 15th. But it was a great day of walking. Yesterday was Sunday, so Tom and I wanted to do our walk along the berges of the Seine, on the roads that are closed to automobiles on Sunday. But as we walked up to the river, a downpour started. We did have an umbrella, but it got to be too bad for that, so we ducked into a bus shelter. After a while, two female American tourists (a mother and daughter, I think) in disposable plastic ponchos entered the bus shelter with us. A French woman and I helped them figure out how to get to the Louvre by bus. We sent them to the other side of the street so they would get the bus going in the appropriate direction. They squealed with laughter as they had to wade through a torent of water rushing down the street. Madame the French woman and I had a good laugh over their antics. Finally it stopped raining, almost, and we continued our walk. It was a lovely, humid but cooler Sunday in Paris. Last night we went with Dan and Mary to Le Basilic, a café behind the Basilica Saint Clotilde in the 7th. Three of us had their roast lamb with white beans specialty. Yummmy.